If you’re in the market for an entry to mid-range blender, then you're in for a treat because we’ve reviewed and compared two of the top brands, Nutri Ninja and NutriBullet. These two brands offer blenders that are packed with great features to help you create healthy dishes, snacks, beverages and deserts in the comfort of your home. Equipped with a powerful motor that can blend various ingredients into a smooth consistency. Compact size only takes a small space on top of the counter and can be easily stored when not in use. Includes cups with lids that you can take on the go. These similarities don’t make it any easier to decide which one to pick but by factoring other unique features, it may be easier for you to decide which one to pick. As with most products on the market today, it can be confusing trying to choose a blender to purchase. Even if you’ve narrowed it down to two brands, Nutri Ninja and NutriBullet, it can still be challenging to name a winner. To help you with that, we’ve written this review that shows the pros and cons as well as the features of these two brands’ blenders. When it comes to price, both brands offer a variety of blenders suitable for various budgets. Apart from this, you should also look at and compare the other features that they have. The ability of the blender to produce the products you want out of it. Do you need a blender for simple smoothies or do you also want to use it for soups? Ease of use, which will allow you to enjoy the process of blending without it feeling like a chore. Overall control while blending is also important because it enables you to customize the end product. Price in comparison to the overall value of the blender. SharkNinja LLC is a well-known brand when it comes to manufacturing various kitchen appliances such as high-end food processors and coffee makers. Nutri Ninja blenders are small and compact but they are also equipped with powerful motors ranging from 900 watts to 1200 watts. These enable the blenders to create silky smooth smoothies, velvety sorbets, smooth purees, creamy butter and more. Furthermore, the Nutri Ninja Pro only operates at a single speed, but it is still fully capable of blending ice and other frozen ingredients. Additionally, the Nutri Ninja with Auto IQ allows you to blend at various speeds depending on the specific model you get. With specially designed extractor blades, the power of the motor is enhanced, making it capable of tearing through even the toughest ingredients. You can blend with frozen berries, seeds, leafy greens or stemmed veggies because these blenders can get through all those ingredients in seconds. Some Nutri Ninja models are equipped with Auto IQ technology which enables you to get consistent results every time you blend with the same recipe. These programs are timed and will automatically blend with a push of a button. The number of programs available for a Nutri Ninja blender varies from one model to another. The blending capacity of Nutri Ninja blenders varies from one model to another. The most compact blenders include cups that have a blending capacity of 470 ml, which is perfect for those looking for a single-serve blender. Larger models, on the other hand, can blend up to 1.4 liters, making them perfect for family use. Cups come in various sizes and even come with spout lids to make it easier for you to take your favorite drink on the go. These are made from Tritan, BPA-free plastic, making them safe to use. Furthermore, all parts easy to clean, whether you prefer handwashing them or using your dishwasher. Most verified users of Nutri Ninja blenders love these compact blenders because of their powerful motors and good blending capabilities. There are mixed views about the Auto IQ feature, with some loving it and others still preferring to manually control speed, pulse and duration. NutriBullet produces a range of high-powered single-serve blenders. The motors used in NutriBullet blenders are all powerful with wattage ranging from 600 to 1700 depending on the model. This allows you to create a variety of dishes from simple smoothies to soups, dips, salsa and desserts. Blades play an important part in the overall capacity of the blender. NutriBullet blades are a little on the blunt side. However these, combined with the fast-spinning motor ensures that the ingredients are pulverized and not just cut. Running at only one speed, you can use a NutriBullet blender for pulse blending by simply pressing down on the jar. This gives you control over the time you want to blend, which is useful in creating salsa or chopping vegetables. Conveniently, a hands-free blending option is also available. The NutriBullet automatically blends on its own once you lock it down the base. To stop it from blending, twist it from the locked position. Plus, there is even a heating cycle for the newest models, making them capable of creating soups without using the stove. The cups that come with the blenders are BPA-free and are easy to clean and dishwasher safe. They can also be used as drinking cups so you don’t need to wash a lot just to drink your healthy beverage. Other accessories included vary depending on the model you purchase but they usually include colored cups, lids, extractor blades, lip rings and jars. Among verified users, the NutriBullet proves to be a good blender to buy, especially for the single-serve preparation of smoothies and other nutritious dishes. Many find the powerful motor capable of doing a variety of jobs but there are still others who wish that it had a speed option. Some blenders from Nutri Ninja have two speeds while NutriBullet blenders only have one speed. 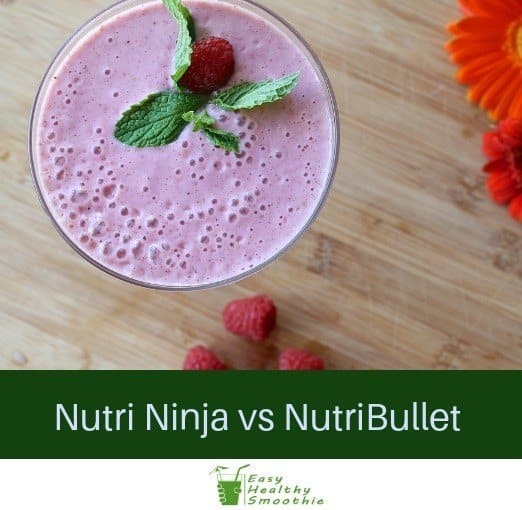 NutriBullet uses blunt blades that are meant to pulverize and not just cut while Nutri Ninja has sharper blades that will tear up most tough ingredients. Nutri Ninja allows for better control over their blenders by providing programmed blending options through their Auto IQ feature. NutriBullet, on the other hand, doesn’t have any buttons to press except for the NutriBullet RX that comes with a button to heat up the soup. Which of these brands is better will depend on your needs and preferences. The only way to figure out which is best is to determine what you need the blender for. It's up to you to weigh your options and consider your budget as well. Personally, I would choose a Nutri Ninja blender over a NutriBullet one simply because I love the Auto IQ feature. It gives pre-programmed blending options for different dishes. If simplicity of use is what you are going for, you may want to choose the NutriBullet because there are no buttons to press. Just lock it in place and it blends on its own.